On some occasions, you will be able to edit an application after it has been submitted to Apply Online. Depending on your selected lender, sometimes you are able to edit applications after they have been submitted. Click on Edit to Resubmit, to unlock the tabs. Make the changes to the application. 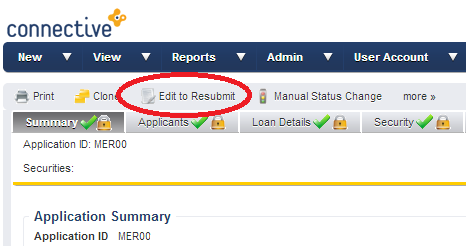 If you do not see the Edit to Resubmit button, this means the lender has not set up this functionality with Apply Online. In this case, contact the lender and they might make the change for you. If not, follow the below instructions. You will need to withdraw the current application, clone it, and submit the clone. Refer to Can I clone an Apply Online application? (change lender).